Continuing our journey with Linux kernel internals, the next few articles in this series will focus on wait mechanisms in kernel. Now, you might be wondering, why do we need to wait in Linux driver? Well, there can be quite a lot of reasons to wait in driver. Let’s say you are interfacing with hardware such as LCD, which requires you to wait for 5ms before sending a subsequent command. Another example is say you want to read the data from disk, and since disk is a slower device, it may require you to wait until valid data is available. In these scenarios, we have no option, but to wait. One of the simplest way to implement the wait is a busy loop, but it might not be efficient way of waiting. So, does kernel provide any efficient mechanisms to wait? Yes, of course, kernel does provide a variety of mechanisms for waiting. Read on to get the crux of waiting in Linux kernel. For a process to be scheduled, it needs to be in TASK_RUNNING state, while TASK_INTERRUPTIBLE and TASK_INTERRUPTIBLE states correspond to a waiting process. So, finally we are able to get the process blocked. But do you see the problem with this code? This process is indefinitely blocked. When and who will wake this process up? Another thing worth noting is that in real life scenarios, process always waits on some event, but our process is put to an unconditional sleep. How do we make a process wait on an event? To find out the answer to these questions, stay tuned to my next article. Till then, Happy Waiting! This entry was posted in Linux Kernel Internals and tagged Blocking IO, Linux Driver, Linux Kernel Development, Linux Kernel Internals, Wait Queues on October 1, 2015 by Pradeep D Tewani. This 9th article in the series of “Do It Yourself: Electronics”, programs a micro-controller without a hardware programmer. In playing around with DIY electronics, Pugs has developed enough confidence to share his knowledge with his juniors. So, in one such occasion, he decided to give a try to program a micro-controller, as part of the electronics hobby club. There have been many hobbyist micro-controllers, like 8051, PIC, AVR, … and an equivalent or more varieties of hardware programmers to program them. However, Pugs’ goal was different – how can a DIY electronics learner, one as he is, do program a micro-controller in the simplest possible way with no unknown pieces of hardware, meaning no external hardware programmers. First fundamental question was if that was even possible. “Hey Pugs, seems like it can be achieved with AVR controllers – they have a simple serial programming mechanism using their MOSI, MISO, SCK lines”, exclaimed his junior Vinay, while going through the AVR ATmega16 datasheet pg 273-277. “Yes, seems possible, at least on the AVR side – we may just have to figure out, how to control these lines from a laptop”, asserted Pugs, reviewing the same. “Can’t we use serial?”, ask Vinay. “Yes, but our laptops don’t have a serial – hopefully USB to Serial converters would work”, replied Pugs. “If it works, it would be great. 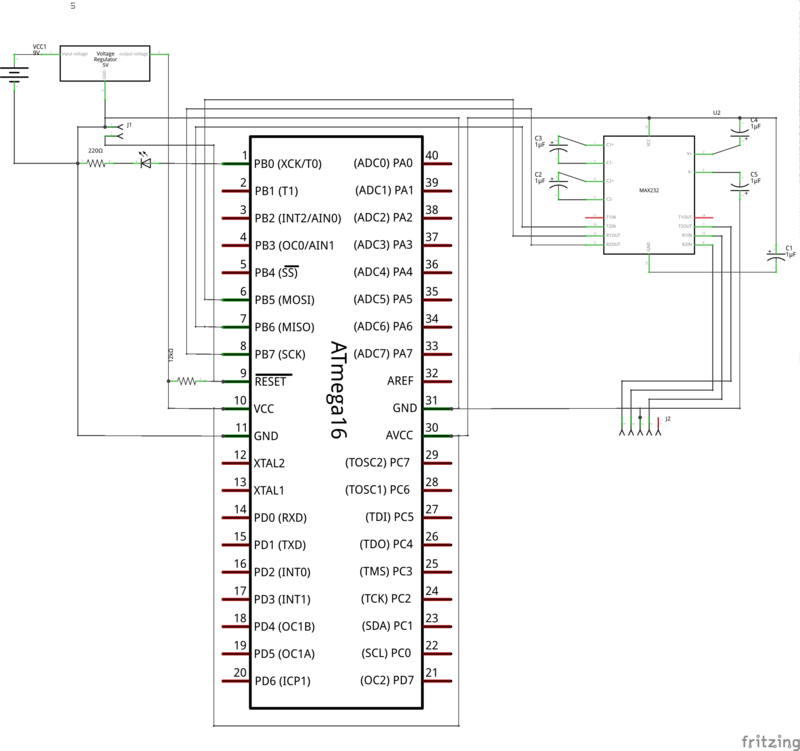 We can then just connect the various serial port lines to the corresponding ATmega16 lines, and then write an application on laptop to download a ‘blink led’ program into the ATmega16”, supported Vinay. “Regarding the application, we may not have to write one, as there is already one open source application called avrdude, specially for downloading or flashing programs into AVRs. We may just have to configure it properly”, replied Pugs. So, they explored further about the same and figured out that ICs like MAX232 are meant exactly for such purposes. MAX232 datasheet gave them the connection details. 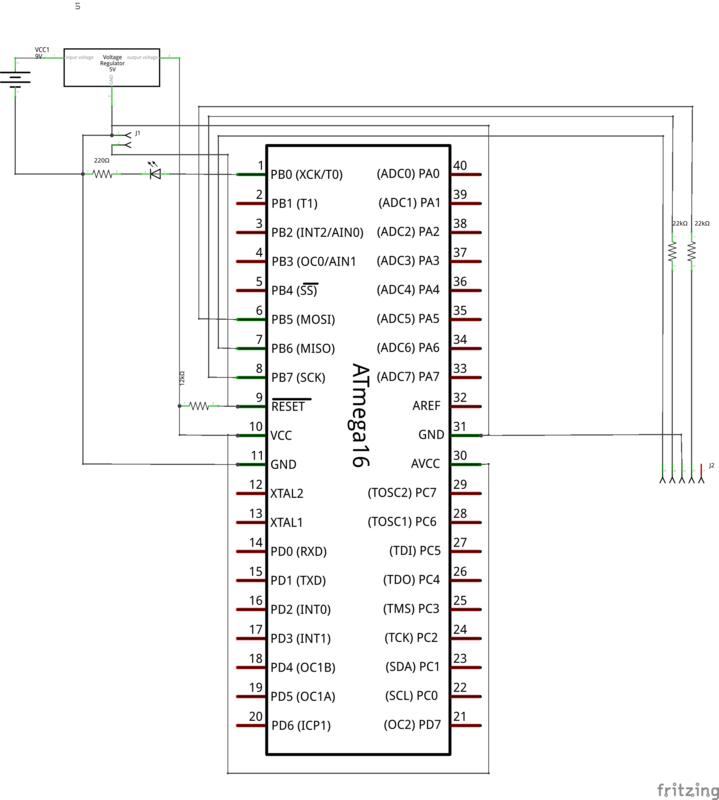 Using that, they set up the ATmega16 and MAX232 connections, as shown in the schematic and breadboard diagram below. They also connected an LED through a resistor to port pin B0 for “blink led” program. Also, they set up the reset circuitry using the pull-up resistor and the jumper J1, as reset needs to be pulled low for downloading the program into ATmega16, and needs to be set high for running the program. So, J1 would be shorted, before starting the programming, and opened for running the flashed program. “Aha! That’s cool. So, now we have the jumper J2 to connect our ATmega16 to our laptop over the serial port. But how do we decide, which lines to connect to what?”, doubted Vinay. “That should be simpler. Let’s open the avrdude‘s configuration file, and look for ponyser section, which is the mode we are going to use for flashing our program”, suggested Pugs. Based on this, they figured out and connected the following serial port line connections with the jumper J2 from left to right in the schematic: CTS (pin 8), RTS (pin 7), GND (pin 5), DTR (pin 4), using the jumper cables. And, finally powered the whole circuitry with 5V from an LM7805 & 9V battery, as shown in the schematic and breadboard diagram above. Why the F_CPU=1000000? As Vinay figured out from the ATmega16 datasheet pg 260-261, that with the default fuse settings of the ATmega16, it runs on a 1MHz clock. Vinay removes the short and viola LED connected to port pin B0 starts blinking with a 1Hz frequency. Interestingly, on his later explorations, Pugs figured out that you don’t even need the MAX232 & related circuitry to do the flashing of an AVR. One can directly connect the MISO line to the CTS pin, as this is input to the serial. And, the other two lines (MOSI to DTR, SCK to RTS) can be connected each through a 22K resistor, thus limiting the voltage into the ATmega16. See the schematic and breadboard diagram below. This entry was posted in Electronics and tagged AVR micro-controller programming, AVR uC programming, basic electronics, basic electronics tutorial, blink led on bread board, blink led programming, bread board programming, micro-controller flashing, micro-controller programming, uC flashing, uC programming on October 1, 2015 by Anil Kumar Pugalia.